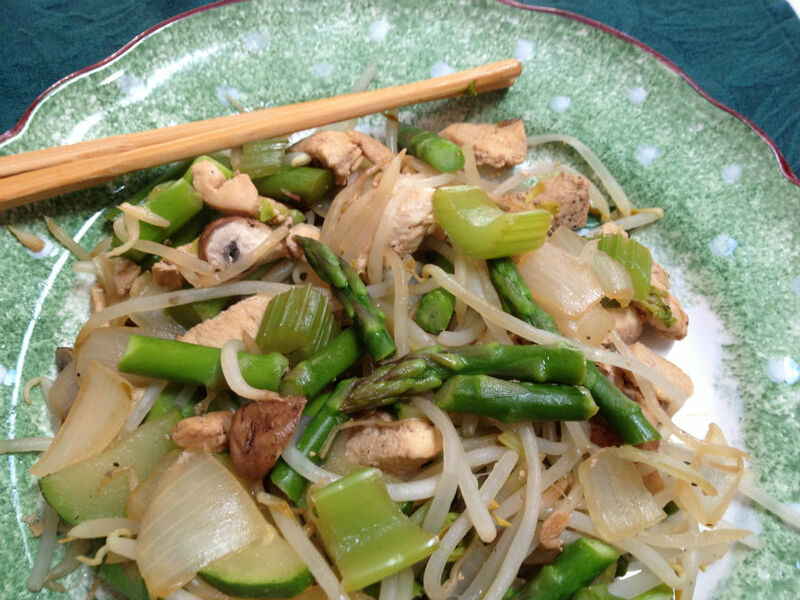 Stir fry is such a fast and nutritious way to serve up a colorful meal. This recipe came from just that need the other night, and I had dinner on the table in less than a half hour. You can save even more time if you slice the chicken and prep the veggies early. I’ll do that often, putting the onions and celery into a baggy, and the other veggies in another. Then they are ready to pour into the pan. One of the best things about it is that you can add any vegetables you have around. I used asparagus, mushrooms and zucchini this time, though sometimes I’ll include broccoli, yellow squash, or peppers instead. The celery, onions, and bean sprouts are standard. The rest varies easily. Simply grab what’s handy and sounds good, then add as much of it as you like. You can really add or omit nearly any ingredient, including the chicken! Substitute tofu and you’ll have a yummy vegetarian dish. You can use chicken thighs instead of a breast, beef instead of chicken. Often I won’t even fix noodles or rice, and just fill up on the veggies. The bean sprouts seem like a noodle to me anyway. One of my favorites is with ramen. If you choose to do that, cook according to package directions, then simply stir noodles (liquid not needed) into the vegetable mix. Or you can serve like spaghetti, putting the stir fry on top. It’s delicious with brown rice too. Fast, filling and flexible. And about as easy as it gets. That is what I love about it. If you want a fun dish to add to the menu, you might try my recipe for Vegetarian Wontons. They take a little time, but you can do them ahead of time. They are tasty treats that are wonderful for an appetizer or a meal! Heat oil and add garlic for 1 to 2 minutes. Add chicken. Saute in hot oil until no longer pink, about 3 to 4 minutes. Add 1 tablespoon soy sauce, celery and onions, and cook for 3 minutes, stirring often. Add the remaining soy sauce, the asparagus, sprouts and sauté about 5 minutes. Vegetables should be cooked through but still crisp. Blend chicken broth with cornstarch, then add to chicken and vegetables. Mix in thoroughly, stirring until slightly thickened. Serve over ramen, pasta, rice, or plain. If serving over a pasta like spaghetti, rather than ramen, I like to mix the noodles in with the vegetables to flavor the noodles. The fun of a stir fry is adding whatever you like, and as much as you like. Every time I fix it, it has different vegetables in it. In other words, most every vegetable tastes so good! If you like cooking Asian dishes, or simply like the light sauté for veggies, a wok is an excellent pan. What a great gift this would be. A 10 piece set including the wok, ladle, chopsticks and draining tray. All in one package Great way to entertain too. Serve the dish right at the table while you sip wine and chat. A wok works best! Ms. Chen’s has a flat bottom with nice high sides. I especially like that both of these pans have a hand hold on both sides. That’s so much easier to use. The carbon steel on this one makes it nice and solid for good, hot, and even cooking. It also heats up fast. Another great set that would make an excellent gift too.